The egret is a classic Japanese design and this set includes four files. The larger egret is 4.89 X 4.63 inches (124.2 X 117.7 mm) and the smaller egret is 3.17 X 3.00 inches (80.4 X 76.3 mm) and each size includes two versions with different color-stops that allow the design to be stitched easily in a wide range of color variations. 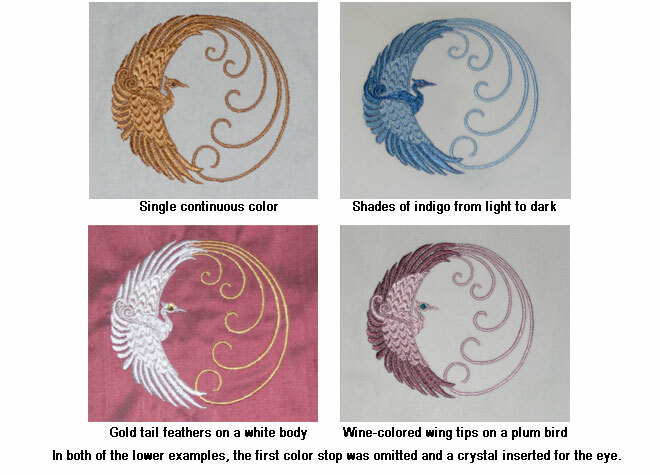 The first file has one color stop for the eye and then allows the body of the egret to stitch smoothly in a single color without stops, while the second file with multiple color stops allows a wide range of personalized color choices for the tail, wing tips, wings and body. A few of the possibilities are shown below. This set is available in JEF, VP3, PES and HUS. Click the appropriate button below to purchase this set in the format of your choice. After the payment has been completed, a password for downloading the design will be generated automatically and sent to the e-mail address used during the purchase. For a more detailed description of the process, please check the “How to buy designs” page listed on the menu bar at the top of the page. If you experience any difficulty, please e-mail me using the contact link also listed on the menu bar above.